Hunkered down in the moss and the leaf mould are some of my favourite winter leaves. You have to crouch to see the detail of cyclamen, but if you do, you will see that every plant is different, bearing its identity in silver-marbled foliage. 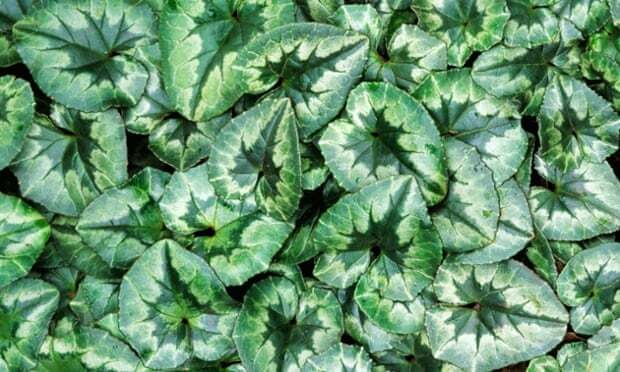 I have grown the ivy-leaved Cyclamen hederifolium for as long as I can remember. Their winter foliage emerges only after they have flowered in September and after the corms have had a summer’s rest below ground. When I first saw them wild in a nut grove on the Appian Way in Italy, I understood why they seize the winter months to do their growing. Tucked away and dormant in the dry shade of summer, their corms come to life again with the autumn rains. Only once they have replenished their reserves do they go back into dormancy, a trigger no doubt spurred by the spring foliage closing over above them. You forget about them almost completely in the growing months and you have to be careful if you are forking among the beds not to damage their corms, but now, when most plants are resting, the cyclamen come through as understudies. Find them room under the skirts of summer shrubs or among leafy perennials that are now dormant. The plants brought from my old Peckham garden were planted into thin turf here under the holly tree, where not much grows. The tree has a high canopy and the light streams in here when it is low. Four years in and the cyclamen are already seeding themselves. Once the flowers are pollinated, the seed head is pulled back to earth by the flower stalk, which becomes a coil to retract the seed into safety. Ants like the sugary coating on the seed and move it about once it is ready to be harvested, but you can often find seedlings clustered close around the corm. If you pot a number up and grow them on in seed trays of leaf mould, they will flower in three years if put in a shady corner. This time last year I selected a dozen or so plants of Cyclamen coum. Its flowers, which range from a piercing magenta through to mauve, soft pink and just off white, emerge as early as December and continue reliably through the darkest months of January and February. I have grown a predominantly silver-leaved range called “Pewter Group” in the past, but I like the differences in the green and silver of the straight species. I planted a dozen in the studio garden in Waterloo through a drift of Viola riviniana ‘Purpurea’. Cyclamen coum prefers a well-drained site and the best I have ever grown are amongst the root plates of deciduous trees. The cyclamen are happy in such conditions, which become open and damp once the leaves are down – a place in the limelight of the dark months.